Just when it seemed like summer was just beginning, it's already time to start thinking about back to school!! And more importantly, back to school shopping! When you are on a tight budget, back to school shopping can be something we dread... but I have great news for you! It doesn't have to be! There are many ways to save a ton of money on back to school shopping, but perhaps one of the best is to buy used! Of course it's nice to have a new outfit for back to school, but I would personally much rather spend less money on more quality used clothing myself! But what if you don't have a good secondhand store in your area? Today, I want to share with you once again a website that I personally use and love- both for myself and my children- Schoola!! What is Schoola and why is it so unique? It’s easy to find great items when you create a custom collection. It’s affordable because every item we sell is up to 70% off the original retail price! You can stretch your family’s dollar even further by earning rewards for spreading the word about Schoola! It’s impactful because when you purchase clothing from Schoola, you are directly supporting our network of over 20,000 participating schools. All of the inventory on our site was donated on behalf one of our 20,000 participating schools. Anyone can donate to Schoola—individuals, corporations, and retailers have all donated to support our mission of helping kids reach their full potential at school. Basically you get great deals on great used clothes, AND help support schools across the country in the process! Even with no additional discounts, these clothes of all sizes (kids, juniors, women and even maternity) can be bought at quite the bargain, BUT the savings don't stop there!! 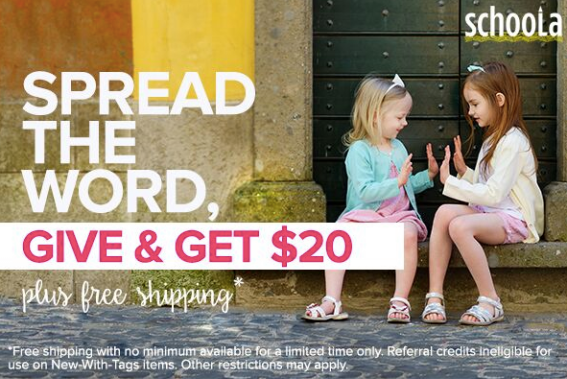 When you sign up, you will receive a FREE $20 credit PLUS free shipping. There is no minimum purchase to use this credit. If you spend $20 even, you'll pay NOTHING for whatever items are in your cart (credits can not be used with new with tags clothing). You can earn even more credits by referring your friends. They also receive that $20 credit AND you'll earn an additional $20 for ever friend who signs up and places an order! Even if they only spend their free $20 credit!! Again, these great coupon codes can be used in combination with your credits, which means it can help stretch that free $20 even further! New members can get $40 of clothes absolutely FREE!! Already a member? If you have $20 credit, you can get $30 of product for just $1... or if you're out of credits, you can still get some GREAT savings regardless!! I know, I know... this sounds too good to be true, right? But it's legit! I have personally purchased from Schoola several times and all have arrived and come as described. In fact, the one time that there was an error in sizing in the listing, I was refunded my credit PLUS some and was able to keep the item too! They have great customer service! And it's not just for kids' clothes! I've ordered for myself too! This is definitely one website that I HIGHLY recommend to anyone looking to save money on clothes for the family! Ready to start saving and shopping for free? 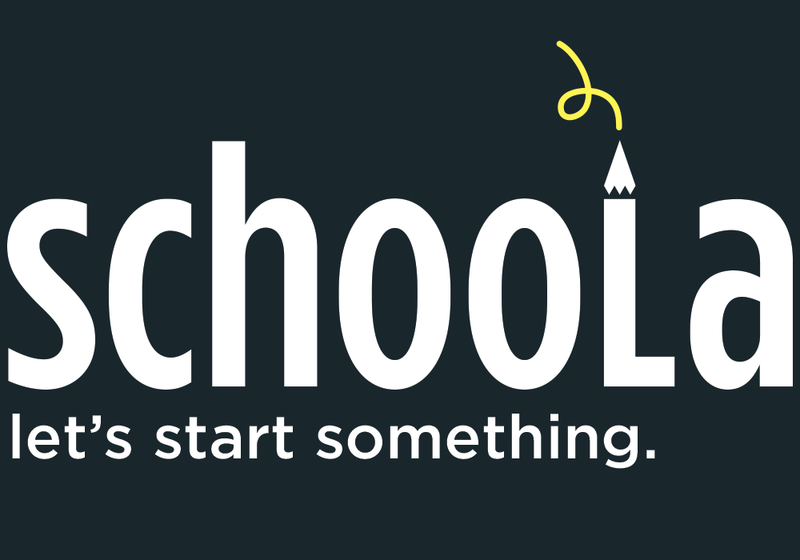 Join Schoola NOW! I love that you are getting great deals and benefiting schools!! SUCH an awesome company!! I have never heard of this site. I will have to check it out and see what they have for used clothes for my kids! This is my first time on this site. Since I'm new here, I guess I need to roam around your previous posts as well to see what exciting deals I could get. It's great to be here. If you have some concerns with you paper works, try Paperwritings to see better results. Our paraphrase help paraphrasing has been imagined as a powerful paraphrasing service that will help students save their precious time. Giving your best to something simply isn’t good enough – there is no time to do all the tasks simultaneously and there is no way that they are all going to be high quality. Essays are usually the area where people try to save time. Many students just borrow somebody’s work and just put their name on it. This brings too much risk with it and we are conceived with the idea of securing students from being accused of plagiarism. You might notice that on Scamfighter they place test orders with different sites to make sure that they have the most relevant information, and there is no place for mistakes. If you do not agree with their opinion, okay, go ahead and place the edubirdie reviews under their post or discuss it in their forum. An actual person manages the service and he can see all the complaints you submit, so he can send you an email or call you if you need his assistance. He hates guys who do that but, after all, no one can say that his reviews are fake!